Top row (left to right): 1. Feather Clark, 2. Sara Ivy, 3. Megan O'Brien, 4. Jamie Neves, 5. Ben Peterson or Pederson, 6. Aaron Grant, 7. Jennifer Miskus, 8. Jeff Butler. Second row: 1. Andrea Madden, 2. Brian Sheehan, 3. Mark Hoyt, 4. Catherine Larson, 5. Tara Sonner, 6. Ayla Inac, 7. Johnny Cortez, 8. Scott Martin. Third row: 1. Ricky, 2. Sabrina Dibiase, 3. Kathy Canfield, 4. Stephanie Foster, 5. Sara Martinez, 6. Matt Dean, 7. Shannon Churich, 8. Kristen Berggren. Fourth row: 1. Kirsten Berry?, 2. Mrs Cosby, 3. Mr Rose (Principal), 4. Brian Lok. Fifth row: 1. Reese Matthews, 2. Janine Self, 3. Jarod Brockmanm, 4. Jason Paderos, 5. Melissa Ensley. Credits: From the collection of Catherine Larson. Thanks to Catherine Larson, Jill A. Iannucci, Shannon Churich, Brian Lok, and Kristine for identifying the kids in this picture. 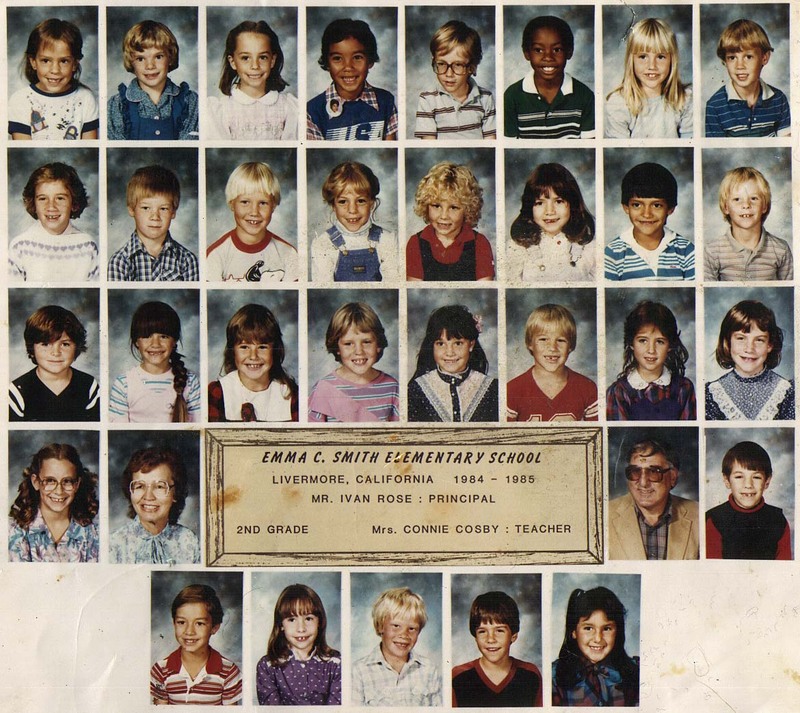 To find other pictures from Emma C. Smith School in the archive, see Livermore class pictures listed by school: Emma C. Smith School. And if you have any pictures from Smith School that you would like to share, please submit them to the Archive.